Treston Ltd specialises in the production of industrial furniture for use in a wide variety of technical and manufacturing environments. Our market-leading products include heavy duty workbenches, ESD workbenches, height adjustable workbenches, as well as a large selection of storage cabinets, storage bins, shelving, chairs, trolleys, lighting and more. All have been specifically designed, developed and manufactured to withstand the daily rigours of an industrial environment. Treston has a long association with the electronics manufacturing industry, and for over 40 years the company has been providing specialised ESD workbenches, trolleys and component bins that reduce the risk of Electro Static Discharge (which often causes damage to the product). 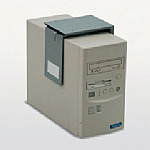 Check out or range of ESD furniture by visiting www.trestonltd.co.uk. When designing products, our experts take into consideration the various ways in which they might be used. They understand the changing demands of modern industry and appreciate the need for flexible, efficient industrial furniture that enhances performance and yet at same time keeps things simple. The result is a top quality range of ergonomically designed furniture that makes life easier for the user and improves productivity in the workplace. Over 40 years of manufacturing experience goes into each and every piece of furniture that we produce, so you can expect nothing less than the very highest quality. Our worldwide reputation stems from the fact that we always produce reliable industrial furniture that will last the test of time. Treston is an ISO 9001:2000 accredited company with TUV approval. As well as high quality industrial furniture, we know that our customers require a high quality service that is tailored around them. Treston therefore adopts a customer-focussed approach to ensure a smooth service from the moment the product is ordered to the moment it arrives at your door. Our customer service teams are always on hand to provide information and advice regarding our products. Give them a call on 01635 521521 today! Below are just some of the industrial furniture products that we have available. To discover the full range, make sure you visit www.trestonltd.co.uk. We have an extensive range of highly practical accessories that can be combined with our packing station benches to enhance functionality and create a bespoke working environment tailored to your business’ individual packing requirements. Upright frames, dividers and shelves provide the basic framework for a range of accessories which includes perforated panels and panel hooks, a swivel arm for LCD screens, tool holder box and tool tray, recycling material bin, bin profile, adjustable shelf and lower shelf and even a bottle holder. Please follow the link to view our full collection of accessories. Our selection of paper roll holders and cutters enables you to place rolls in a position to suit your requirements, whether it’s underneath one of our workbenches, secured to an upright arrangement or freestanding next to the workstation. And whichever you choose you’ll find a choice of sizes to meet your needs. Our freestanding unit gives the opportunity of storing up to two rolls and can be combined with our cutter unit to offer a complete solution. Steel Cabinets ML – choose from a selection of cabinets with different size drawers, cupboard space and dividers. 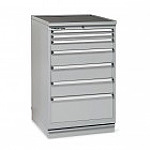 Light Steel Cabinets LMC – choose from a range of cabinets offering one, two or four drawers or a cabinet/ drawer model. Covers are also available. Drawer Unit 55 – this unit is supplied with additional compartment inserts to store various items effectively within the draw. Drawer Unit 70 – this unit is available in different sizes and can also be supplied with suitable compartments trays. Whatever your storage requirements you will find a solution with our fantastic range of robust shelf cabinets that have been designed for industrial environments. We offer two different styles: the HKS 100/200 which are manufactured from welded sheet steel and grey conductive epoxy powder coating to provide excellent resistance against wear and tear, whilst the HK 100/180 is better suited to light storage. Both styles are available in a choice of sizes and come complete with shelves. They have been designed to be used in conjunction with our range of storage bins and containers for optimal organisation. Treston workbenches, workstations and other industrial furniture may be customised with a range of accessories for attaching computer hardware such as keyboards, monitors, LCD screens and tower systems. All components, shelves, stands, arms and brackets within this category are designed and manufactured to meet the demands of a modern industrial environment. Take a look at our range at www.trestonltd.co.uk. Our CPU Computer Stand allows both horizontal and vertical CPUs to be safely stored under our bench worktops via an adjustable bracket that can accommodate vertical CPUs of 130-240mm wide and 395-500mm high, and vertical CPUs of 340-460mm wide and 180-285mm high. This versatile unit can be used in conjunction with many of our benches and trolleys including WB workbenches, TP and TPH workbenches, SAP mobile benches, CTR mobile bench and our WTR 140 universal trolley. Upright CPU units can be conveniently stored under one of our height adjustable workbenches with our CPU2 PC holder, giving operators extra space on their workbench and preventing possible damage from the unit being positioned on the floor. It can also be used with modular benches TP/TPH and moveable bench SAP. A generous height adjustment range of 280-550mm and 65-240mm width ensures its compatibility with the majority of upright CPUs and it offers a maximum load capacity of 35kg. The LDC bracket MH is a robust accessory that allows a flat screen monitor of up to 15kg to be safely mounted on to a workbench arrangement via a connector. This frees up workspace and also allows the screen to be ergonomically placed at a height to suit the user. It has been designed to accommodate monitors with 75/100mm mounting holes and can be used in conjunction with our WB Workbenches, TPH Workbenches and WTR Trolley. Further information and current prices can be found on our website. Our MA swivel arm has been designed to accommodate a flat screen panel monitor of up to 10kg and comes complete with arm and plate which facilitates movement of the screen through a 180° radius allowing the user to achieve optimal ergonomic alignment for their specific tasks. This bracket is suitable for use with monitors that have 75/100mm mounting hole centres and is compatible with our WB and TPH workstations, although a separate connector is needed for the latter. Alongside our MA swivel arm we also offer our MA-2 swivel arm which offers a higher load capacity of 15kg via its strong double articulated arm. As with our MA model the MA-2 allows a monitor with a 75/100mm mounting hole centre to be positioned at eye level and manoeuvred across a 180° radius in order for a comfortable operating position to be achieved. When combined with panel hooks, our perforated panels can be used to store all manner of tools and equipment, keeping workbench areas uncluttered and clear enabling workers to carry out their tasks. Fabricated from tough epoxy powder coated steel, the panels’ perforations are 9mm and are situated at 38mm centres. We offer a range of sizes that can be used with our WB, modular TPH and heavy duty workbenches. Details of the different sizes available and current prices can be found on our website. Just as poor posture and positioning of the body can have a detrimental impact on your health, so too can poor lighting, therefore creating an optimally lit workspace for your employees is vital in safeguarding their health and also reducing absenteeism and improving performance. Research shows that light affects our moods, energy levels and even body clock, therefore getting it right can have a profound impact on shift workers. The invisible but constant flickering of many standard lights is attributed to headaches and eye strain which results in lower levels of productivity. Flickering lights can also be highly hazardous when working on objects that are rotating at high speeds as it can often look as though the object is stationary. Investing in high quality task lights is particularly paramount for many industrial applications where precision and speed are required. This 1,200mm long fluorescent lighting unit can be easily fixed to our height adjustable, modular, moveable and heavy duty workbenches and allow the user to adjust the angle of the light to suit the particular task they are working on. This high quality unit does not flicker when it is turned on and also features an anti-dazzle screen to reduce glare. All overhead units are isolated and have their own switch. We offer a standard unit and also one with an integrated dimmer for increased user control. You may find that some applications undertaken at your organisation require a sidelight and our sidelights have been constructed to provide operators with a user-friendly solution that will enhance their working environment. As with our overhead lights, this unit features anti-flicker ignition and an anti-dazzle screen. These help to reduce eye strain and fatigue, thus having a positive impact on productivity. These can be mounted on to the upright profiles of our height adjustable and heavy duty workbenches or with a separate mounting kit for our modular benches. For precision applications our LED task light provides the perfect solution. 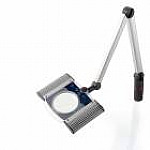 Featuring six LED lights and a dimmer function for superb lighting control, as well as a generous 127mm, 3-diopter integrated magnifying glass, this desk-top light is a must have for numerous workbench-based applications. It boasts a maximum light intensity of 2,800 lux and a cool colour temperature of 6,000k. A two meter lead and adjustable clamp allows the light to be placed in the best possible spot whilst an intelligent memory allows the user to turn the light on at its last setting. Our HiLite LED lamp boasts a class A energy rating giving outstanding energy efficiency and it supports an array of precision applications where a well lit workspace is essential. It emits a natural light colour of 4,000k and has a superior luminous emittance of 1,800, over three times higher than that of standard office lighting. The HiLite is designed for fast, simple attachment to any of the Treston Group’s lamp mounts and with a service life of up to 50,000 hours you will be assured of outstanding lighting day after day. We offer two different styles of universal trolley, which when combined with our trolley accessories can make tasks that require the portability of equipment and tools extremely simple and lead to enhanced efficiencies. Our standard model features three shelves whilst our universal trolley kit-1 has the addition of a keyboard shelf and electrical trunking. Both models gain their mobility via four swivel castors, two of which have breaks. Our range of accessories for the WTR trolley include an extra shelf for expanded storage capabilities, an adjustable shelf that can be adjusted not only on height but also depth and angle, bin profile for stacking and picking bins and electric trunking that features four switched single sockets. We have a choice of trolleys that allow shelf height to be adjusted to suit different loads; a two –shelf trolley (150kg maximum load capacity) and a four-shelf trolley (300kg maximum load capacity). Each of the trolley styles is available in different sizes. These are complemented by a range of accessories designed to enhance functionality including: extra shelves, end mesh panels for keeping items secure during transit, and a useful A4 document holder. Our industrial trolley unit has been designed to offer complete flexibility to workers in a range of industrial environments and allows you to create a mobile unit to suit your specific needs through our comprehensive range of additional accessories. As well as our standard industrial trolley we have compiled two trolley kits to get you r started. Kit-1 includes has an integrated shelf and perforated panel cupboard, whilst kit-2 comprises a flat shelf and three angled shelves. You can further enhance your trolley with the following accessories: steel shelving, bin rails, perforated panels and/or cupboard units. This lightweight, highly portable trolley is manufactured from an aluminium frame and steel legs and gains its strength from two interlocking profiles. Its innovative design allows the user to either place the laptop directly on the low-pressure laminate worktop or store it underneath so that only the screen is visible. The design also incorporates holes for easy cable access when required and a gas spring provides effortless height adjustment of between 800mm and 1,200mm. Treston Ltd is pleased to offer its customers an extensive range of upholstered chairs that have all been ergonomically designed and user comfort and safety as a priority. The range offers a choice of seat sizes and depths, height adjustment ranges and colour options and we also have high chairs with integrated supportive footrests, saddle stools and our X40 and X40L which feature added back support via a taller back rest and the X40 also providing a head rest. Full details of our range of upholstered chairs, along with current prices, can be found on our website. The attractive modern design of our industrial chairs will suit any work environment, but don’t be deceived by their looks; these chairs offer the pinnacle of ergonomics and are designed to provide the very best support for users. Both the XP20 and XP25 feature gas-lift height adjustment, back rest height and angle adjustment as well as seat tilt adjustment. The swivel castors of the XP20 offer mobility whilst the XP25 benefits from a height adjustable integrated footrest. Our industrial range also features a height adjustable stool. Each product in this range has a durable polyurethane coating providing resistance to water and allowing the chair to be cleaned as necessary. Treston Ltd’s arm rests are highly adjustable, in both height and depth, allowing the user to adapt them to suit their body shape and are very important when it comes to achieving an ergonomically healthy work environment. Correct use of these adjustable armrests will help to lessen shoulder strain and alleviate upper shoulder tightness and backache. These armrests are compatible with the following Treston chairs: X20, X25, X30, X35 and X40. Many organisations ignore or are unaware of the fact that the lower body can also be at risk of RSIs and improper positioning at desks can lead to absenteeism from back pain and muscle tenderness. Ergonomic footrests are designed to enable the user to sit in a comfortable position that relieves the pressure placed on the back muscles, thus preventing muscle fatigue and injury. People using these footrests will not only be able to achieve better posture, but through the added feature of massage balls and massage rollers, will also see benefits from improved blood circulation, reducing the likelihood of developing blood clots and varicose veins. Treston’s JT foot rest has been ergonomically designed at the perfect angle to reduce back strain for workers who are sitting down for long periods of time, reducing strain placed on back muscles and the spine and preventing absenteeism from muscle ache. The unit features an integrated massage roller which allows users to exercise their feet throughout the day, improving blood flow. Manufactured from robust moulded polystyrene and with added safety from a corrugated surface to avoid slipping, this foot rest measures 500mm x 370mm x 100mm. Our range of lightweight and portable fabric screens can be used as single items or combined together to create divided workspaces within open plan areas. They are available in four different height and width combinations allowing you to custom a configuration for your needs and come in a choice of blue or grey. Each panel is constructed from hardwearing anodized aluminium frame, which allows for easy maintenance, and offers stability via two T-legs. Please see our website for specifications of the sizes available and to make an online purchase. Our perforated screens offer the same advantages of workspace division as our fabric screens, but also allow users to hang, store and arrange items by using our perforated panel hooks and accessories. This allows you to create a unique work environment that suits your needs exactly and helps to achieve a clear workspace. We offer four different sizes: 750mm(l) x 1245mm(h), 750mm x 2000mm, 1050mm x 1245mm and 1050mm x 2000mm. Each panel is constructed from an anodized aluminium frame and epoxy powder coated steel perforated panel. We also sell our fabric panels as two-panel sets that are used in conjunction with each other to make a larger screen. They come with three T-legs, the middle of which helps secure the two panels together. As with our single fabric panels, these sets are available in a choice of four different sizes with the option of grey or blue fabric covering. Please see our website for full sizing details as well as our current prices. Create a professional looking workspace layout with our two-panel corner screen sets which combine two fabric panel screens with a corner leg for the perfect fit. We have a range of sizes available to choose from in order for you to create the best combination for your particular set up, and panels come in a choice of blue or grey antistatic fabric. Please follow the link for full sizing details and to view our current prices. Our screen panels can be purchased as separate units, without legs, providing you with greater flexibility for creating arrangements to suit your needs and for using them how you see fit. Legs can be purchased and added on separately. Choose from blue antistatic fabric, grey antistatic fabric or perforated steel panels each of which is available in four different sizes (750mm x 1245mm, 750mm x 2000mm, 1050mm x 1245mm and 1050mm x 2000mm). Our choice of legs ensure you can create a unique screen panel combination to suit your needs, whether you need support for single panels, straight line assemblies or want to incorporate a corner into your configuration. Single panels require two legs, corner sets require a leg at each end and a corner leg for the middle, and straight assemblies will need two legs for the initial panels and one leg thereafter. If you are in any doubt of the legs you require for your choice of panels and chosen assembly, please do not hesitate to contact us for advice. We have developed bin profiles for use with our panel screens, which enable workers to better organise their workspace, parts and accessories, allowing essential items to easily be at hand. Each profile has a load capacity of 10kg and a combination of 3 profiles on each side of a panel can be used. Profiles and manufactured from a combination of aluminium and epoxy powder-coated steel and are available in widths of 700mm and 1000mm to fit our different sizes of panels. Organising your workspace couldn’t be simpler with our robust steel shelves that have been specifically designed for use with our screen panels. Sold as single units, you can add up to three shelves to each side of the panel and each shelf offers a load capacity of 10kg. Choose to either sit your shelf on top of the supplied brackets, or alternatively you can hang them from the brackets, which creates shelf ends to stop items such as folders and books from falling off the ends. We offer two different sizes to match our different size panels. Under-desk power sources can be difficult to reach and our power channels for panel screens make routing around under desks a thing of the past, giving easy access for power tools, lighting, laptops and other electrical items. All our power channels are wired and ready for use and can be tailored to your specific needs with our range of optional components which includes single switched sockets, data connectors and telephone sockets. Stylish in appearance yet fully functional in design, Treston’s visible storage cabinets are suitable for a variety of industrial environments. They provide a compact storage system for up to 360 different items and are available in two sizes; 550mm and 290mm (height). The drawers are made from a transparent polystyrene material which enables the user to see the contents. Self adhesive labels are also provided for speedy identification. Cabinets may be wall hung, stood on the worktop, or mounted on top of turntables or trolleys. Treston also manufactures storage bin cabinets which may be vertically stacked, wall hung or mounted on turntable assemblies – these are suitable for storing larger items. Also available are our high density cabinets, which may be fitted with castors for mobile storage. These robustly constructed storage solutions can hold up to 336 different items on a floor area of only 0.25m². You can find out more about our visible storage cabinets, storage bin cabinets and high density cabinets by visiting the Treston website. Our spacemisers offer the ultimate in storage and functionality and they are particularly useful in industrial environments where access to a large amount of different items and components is required. This floor standing unit features ball-bearing rotation movement for easy access and enables twelve of our series 550 visible storage cabinets to be stacked over three layers (ie four cabinets on each layer). This set up allows you to choose the exact combination of clear small drawers for your needs dependent on the size of components you are looking to accommodate. Please follow the link for further information and to find out more about our 550 series cabinet combinations. Compact and highly practical, our range of table top spacemisers give the perfect solution for organising small components and enhancing efficiencies by enabling workers to have everything within arm’s reach. Our standard bench top spacemiser has a ball bearing base to allow the unit to be turned easily and has been built to accommodate two visible storage cabinets from either our 290 or 550 series, which are purchased separately. We also sell two spacemiser kits which come with our most popular cabinets included. Please see our website for further details of the contents of each kit. Alongside our spacemiser and bench-top spacemiser we also offer another two floor-standing turntable assemblies which accommodate storage bin cabinets. The 16-300 houses 16 of our 300mm depth bin cabinets (0830 or 1630 series), whilst the 16-400 is built to hold 16 of our 400mm depth bin cabinets (0840, 1640, 0440 series). Both assemblies are 1680mm high and offer generous load capacities of 800kg. Please follow the link for full details and current prices as well as to view a video of the units. Treston produces a range of storage bins and containers made from highly robust plastics that can withstand intensive use in demanding industrial environments. This includes shelf bins (with a choice of either corrugated or smooth internal base, the former of which is particularly useful when working with small and difficult to pick items), stacking bins, picking bins, storage bins, containers and clear storage draws and bins. Each is available in a wide choice of sizes and we also sell a range of accessories to complement our bins and containers, including dividers, labels and shields. For more information, including dimensions and intended application uses, please head directly to our website. Storage stands come in a range of configurations to suit the requirements of each individual customer. Both static and mobile variations are available, with double or single sided shelving for storage bins or cabinets. Our Bin Trolley BT-170A Kit includes eight adjustable, double sided aluminium bin rails measuring 753mm in length, capable of holding up to 72 blue stacking bins (two different sizes). Total load capacity is 150kg. Find out more about the other storage stands we have available by visiting the Treston website. To complement our extensive range of stacking bins, transparent drawers, containers and cabinets we also offer an equally comprehensive selection of dividers, labels, shields, retaining bars and lids to enable fast, easy compartmentalisation, identification and containments of items contained in storage bins and containers. Please follow the link to discover more about this range and to make your online purchase. Treston Ltd has been supplying the electronics manufacturing industry with ESD workbenches and furniture for over 40 years, so you can rely on our products for total protection. The Treston ESD range is extensive and includes Height adjustable ESD workbenches including our moveable ESD bench, side worktop, corner worktop and tilt workbench configurations all of which meet cleanroom requirements and comply with the international standard EN ISO 14644-1 class 7. For more information and advice, please consult the Treston Ltd website or get in touch with the Treston team on 01635 521521. Treston makes available the same great range of industrial workbench accessories in ESD format for both our height adjustable and modular workbenches, which have been specially developed to prevent product damage caused by Electro Static Discharge. Our range is extensive and includes items such as shelves, bin profiles, perforated panels, cable clips and tidies, power chanels and accessory frames, full details of which can be found on our website along with information about the dangers of ESD in the workplace. If you would like any further information or advice, please consult our customer service team. Two of our popular drawer cabinet unit styles are also available in ESD format. Our light steel cabinets come in a choice of four different sizes and drawer/cupboard configurations but each is manufactured from semiconductive epoxy powder coated steel whilst the draw fronts are semiconductive coated composite board with aluminium handles. Our 45cm drawer units are also suitable for use in electrostatic protective areas. There is a wide choice of six different units that are designed to be used in conjuction with our workbenches. The units are finished in epoxy powder coated grey paint. Full details of the different sizes available can be found on our website. Our range of shelf cabinets is suitable for use in electrostatic protective areas since they are finished with a semiconductive epoxy powder coating. This applies to both the HKS 100/200 for industrial storage and the HK 100/180 range which is better suited to light storage applications. Both styles are available in a choice of sizes and come complete with shelves. They have been designed to be used in conjunction with our range of ESD storage bins and containers for optimal organisation. Our ESD small parts shelving units offer the flexibility needed for today’s industries and are modular in design, allowing you to create a shelving configuration to suit your needs exactly. Each modular unit is 1000mm wide by 2020mm high. It comes with six shelves and can be made to a depth to match your requirements by choosing from shelving depths of 400mm, 500mm or 600mm. Extension units and extra shelves can be added to create a bespoke shelving solution. The frame and shelves are finished in a light grey semiconductive powder coating and the unit is connected to earth with a 1MΩ resistor. We have an extensive choice of ESD trolleys which includes: universal trolleys, adjustable two and four shelf trolleys, industrial trolleys, height adjustable moveable benches and a reel trolley holder that has specifically been designed to store and transport SMD reels. We are pleased to also offer a comprehensive range of accessories to suit each trolley style. Please see our website for full details of each trolley style. Our extensive selection of upholstered and polyurethane chairs are also available as part of our ESD product range and are built to withstand the most demanding of industrial environments. We also have ESD versions of our footrest and armrests. All of our ESD chairs, footrest and armrests conform to IEC 61340-5-1 international standard having been fabricated from materials that are electrically conductive, right the way down to the conductive castors. To reap the full benefits of these chairs, we recommend use with ESD flooring. Treston is pleased to offer two different adjustable wrist straps that are suitable for use in antistatic environments. We have designed the J3170 to appeal to field workers with its highly durable nature, retaining its elasticity through frequent wear and removal. This strap offers a resistance of 1 MΩ in every socket and is easily adjustable and can be re-adjusted as needed with no loose links. The JA68Yis great for universal use, even for those suffering skin allergies as its design features no metal to skin contact. It also has 1 MΩ for each socket. For further details of each, including current pricing, please see our website. Our ESD earthing cable is for use in conjunction with our ESD bench mats and measures 0.7m. It features a 10mm conductive male press stud and offers resistance of 1MΩ. Our ESD bench mats are fabricated from Norastat static dissipative rubber that is comprised of two layers – a dissipative top layer and a conductive bottom layer, the combination of which provides protection for workers, electronic components and devices. Providing excellent durability, the blue mat measures 900mm x 600mm x 2mm and offers a maximum surface resistivity of 0.1MΩ/sq. Full details can be found on our website with current prices and lead times. Correct storage of components within electrostatic protective areas is paramount when ensuring safety throughout the production process. We have designed a range of storage cabinets that benefit from ESD compliance to international standard EN ISO 14644-1 class 7, as with all our other ESD products. We have a choice of four different small parts storage cabinets that are made from semi-conductive polypropylene and galvanised steel, ESD bin cabinets in a variety of sizes, and freestanding ESD high density storage cabinets with optional castors for manoeuvrability. Our popular and highly practical turntable assemblies are also available in ESD format. This includes the 12-550 ESD spacemiser capable of holding 12 small parts storage cabinets, PTP- ESD bench top spacemiser for two small parts storage cabinets and both the 16-300 ESD and 16-400 ESD turntable assemblies that offer high capacity storage solutions for our ESD bin cabinets. Full details of each model with dimensions and current prices can be found on our website. Our ESD product range wouldn’t be complete without storage bins and containers and we have an extensive choice that ranges from small picking bins right the way up to 36 litre storage boxes that have been designed for use with internal and external transport systems. All of our ESD containers are manufactured from a combination of polymer and a special carbon black to create the conductive properties necessary to achieve ESD compliance to international standards. Each offers a surface resistance of 103-106 ohms. Alongside our range of ESD cabinets, turntable assemblies and shelving products we also offer a range of ESD freestanding storage stands and trolleys. These double sided units are designed to accommodate either a combination of small parts cabinets or your chosen configuration of stacking bins. Each unit is fabricated from steel that has been finished with a light grey semi-conductive epoxy powder coating. Our storage stands can either be purchased as individual items or as part of a kit containing a selection of bins or small parts cabinets. Please see our website for full details of each of the options available. We have dividers that are compatible with our range of ESD bins and containers, which include small parts drawers, shelf bins and stacking bins. Dividers for small parts drawers and cross dividers for shelf bins are fabricated from semi-conductive polystyrene are sold in packs of 10 whilst length way dividers for shelf bins and stacking bin dividers are fabricated from semi-conductive epoxy powder coated steel and are sold individually. We hope that you are able to find all the information you need about us and our product ranges from our website, however if you have any questions at all or would like to discuss any of our product ranges in more detail, we would love to hear from you. You can find the details of how to contact our customer services team by following the link above. We look forward to hearing from you. Treston Ltd has particular expertise in the production of industrial workbenches that are ergonomically designed to improve performance and robustly constructed to withstand the rigours of a harsh industrial environment. The range includes our new generation of WB-Series height adjustable workbenches, which allow users to adapt their workstation to suit a variety of tasks, our TP/TPH-series modular workbenches and our HDB-series heavy duty workbenches with a choice of work surfaces. Our range of robust and highly practical height adjustable workbenches are all made to the same exacting standards that you would expect from a Treston product. We know that no two working environments are the same and therefore have designed our workbenches with a choice of sizes and operating mechanisms to suit differing needs. For increased practicality the range is complimented by a selection of add-on units, including side worktops and corner worktops that can be joined to increase work space. If required we also have a workbench with tilting worktop, allowing workers to select the perfect angle for their particular task. Our modular workbenches offer organisations complete flexibility when designing a workbench layout for light assembly tasks that takes into account the individual needs of your business. The collection contains standard workbenches, workbenches with added upright profiles, line extensions, angle extensions and corner workbenches, each of which are available in a choice of lengths and depths allowing you to create a quality bespoke arrangement that’s assembled unique to your requirements. 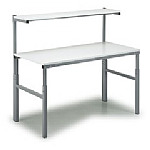 Featuring height adjustment via allen key, these workbenches are suitable for either standing or sitting work. If your operations require mobility then you may be interested in our mobile benches which feature robust swivel castors for effortless manoeuvring of loads up to 150kg. A lower shelf can be added increasing the load capacity by a further 30kg, whilst the option of a handle is also available for easier operator control. Mobile benches are available in a choice of sizes, details of which can be found on our website along with our current prices. We have developed a range of heavy duty workbenches that are designed to stand up to the diverse demands of any production or assembly line, service centre and even workshops. Although this range of workbenches has been built for strength we haven’t compromised on design. Each is constructed using modern and extremely robust powder coated steel to create the frame, which includes a bracing panel for extra strength, and is available with a choice of steel, PVC or birch worktops to compliment your premises. 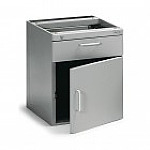 You also have the option of an integrated steel cabinet unit for combined storage. To complement its excellent range of industrial workbenches, Treston makes available a large selection of workbench components and accessories, including supporting brackets, swivel arms, keyboard shelves, electrical trunking, upper shelves, lower shelves, adjustable shelves, bin profiles, perforated panels and more. Like all Treston products, our industrial workbench accessories have been robustly constructed for enhanced performance in the most demanding working environments. Take a look at the range by following the link directly to the Treston website. Treston Ltd has a choice of three styles of packing stations to choose from. Our TPA packing station is available in four different sizes and is built to withstand loads of up to 300kg. The worktop can be adjusted via a simple allen key mechanism to suit your workers’ needs and can be combined with numerous accessories to create a bespoke working station. The PPH packing station features an upright profile that supports an integrated laminate shelf with carton dividers, as well as incorporating supports for paper and cardboard rolls. Finally our workbench packing stations come in a choice of sizes with the option of allen key, hand crank or motorized height adjustment. Our new range of packing trolleys introduces new levels of flexibility and efficiencies to packing applications, and includes a recycling materials trolley that can accommodate either one or two bins, a packaging materials trolley which can be used to store all packing essentials such as envelopes, paper and cartons, a mobile bench with scale display holder for weighing packed items and a printer trolley. Please see our website to find out more about these items and to see our current prices. If you've any questions about Treston Ltd products or services feel free to ask them here.